The Topps Vault (www.TheToppsVault.com) has teamed with PSA and eBay to offer collectors one of the most limited Star Wars collectibles ever created. 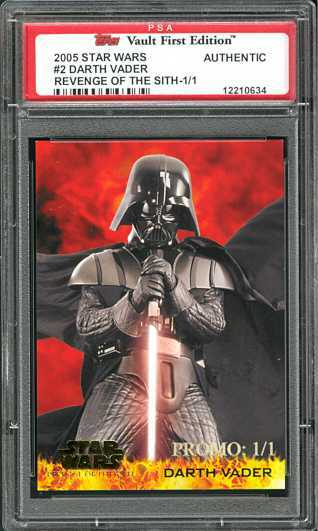 PSA has graded a one of a kind complete set of special edition Topps Star Wars: Revenge of the Sith cards. There are 90 different 1 of 1 cards and each one is foil stamped "PROMO: 1 of 1". The slabbed 1 of 1 collectibles will be put up for auction on eBay this evening (5/19) in celebration of the film's release. According to Beckett Media, Star Wars is the most popular movie trading card franchise ever produced. When it comes to trading cards, the Force is with George Lucas' space epic. Over the past 28 years, over 250 Star Wars trading card sets have been produced (including more than 40 from Topps) in over 20 countries, encompassing nearly 10,000 cards. The most sought-after Star Wars cards are the ultra-rare, one-of-one Sketch cards that were inserted into 2004 Topps Stars Wars Heritage. Those cards feature original artwork from Star Wars artists. "Before Star Wars, trading cards for movies weren't big business," says Doug Kale, Beckett Entertainment editor and contributing editor of Beckett's Collectibles From A Galaxy Far, Far Away. "We based our list of top movie card franchises on several factors - overall sales, pricing on the secondary markets, total cards manufactured, numbers of countries in which the cards were distributed and, of course, demand. By just about any measure, Star Wars is light years ahead of the competition."